A 12-run, eighth-inning rally in a February game in Phoenix ignited a powder keg under the College of Southern Nevada baseball team which has was 21 games in a row. It was Feb. 2 on a dusky Saturday afternoon in the Valley of the Sun. But the sun was not shining, not even metaphorically, on the College of Southern Nevada baseball team. The Coyotes had lost four of six games to open the 2019 season. It was the eighth inning, and they were trailing GateWay Community College of Phoenix 12-4. 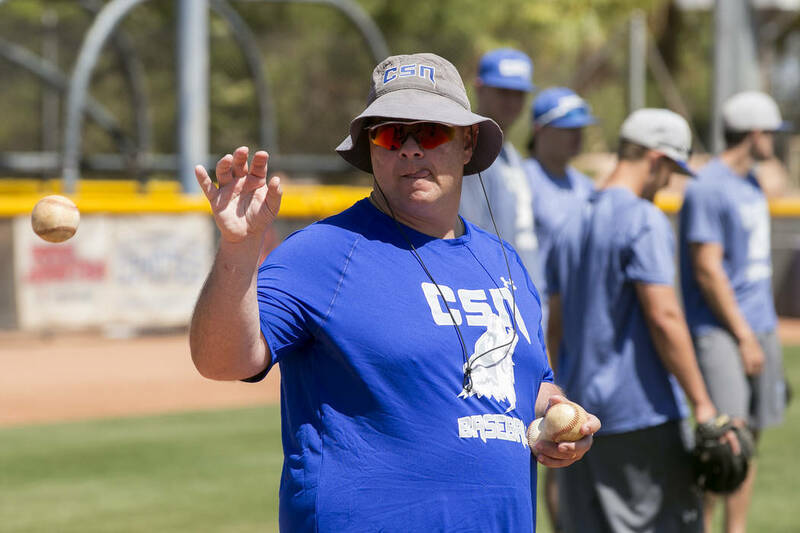 Although getting off to a slow start was not unusual for CSN, veteran coach Nick Garritano was having thoughts he would never share with his players. The year got a little shorter when the Coyotes scored 12 runs in the top of the eighth. As far as putting it lightly goes, that statement ranks right alongside Mario Mendoza’s Wins Above Replacement. It would be the first victory of 21 in succession for CSN, a winning streak that has vaulted the 23-4 Coyotes to a No. 4 national ranking heading into a four-game weekend series against Utah State Eastern at Morse Field in Henderson. If you’re scoring at home, or have even the slightest interest in baseball biorhythms, this is the same team that ended CSN’s 19-game winning streak last season. More biorhythm stuff: Should the Coyotes sweep Friday and Saturday doubleheaders, and should Salt Lake Community College take care of business against Idaho State’s club team, it will set up a four-game series in West Jordan, Utah, next weekend pitting a team riding a 25-game winning streak against another having won 22 in a row. It would be the junior college baseball equivalent of “Batman v Superman: Dawn of Justice.” Actually, it probably would be better than that. Garritano says he is not planning on wearing the same socks or underwear to this weekend’s games, per big-league tradition of not tempting fate, the baseball gods and Mario Mendoza’s spray chart. “I think some of the kids are,” he said, which would explain the biohazard sign on the CSN clubhouse. Outside of that 16-12 game that started it all, the CSN streak hasn’t featured multitudes of drama. Only three of the 21 wins have been one-run games. Only one — a 6-5 victory over 11th-ranked South Mountain of Phoenix on Feb. 9 — was of the walk-off variety, with former Rancho Ram Joseph Walls providing the heroics with a two-run homer. Other streak highlights: a 2-1 victory over College of Southern Idaho, the fourth-place finisher in last year’s JUCO World Series; a four-home-run, 14-RBI outburst by broad-shouldered Nick Hernandez in a series against Prairie Baseball Academy of Canada that netted the Bishop Gorman product national player of the week laurels; a combined no-hitter by Nick Rupp (Spring Valley) and Trever Berg (Basic) against Colorado Northwestern last Friday. Two games of that series were canceled by snow and rain. It was the first time since falling behind 12-4 against GateWay College on Feb. 1 that the sun hasn’t shined on the Coyotes. As Garritano says, there’s still a lot of baseball to be played. But he no longer sits in the dugout thinking this might be a long season.